In 2015, the boulder used to jump and cross the gap to the Isolated Buttress became loose and concerns were raised about the hidden danger should the boulder fall whilst in use, so BMC volunteers decided to remove it immediately. As a result, the Isolated Buttress is no longer as easily accessible and new means of reaching the sector have developed, some of which are not recommended. Following on from this decision, Alan James announced that Rockfax would like to offer financial support to the project from the proceeds of the new Southern Sandstone guidebook. 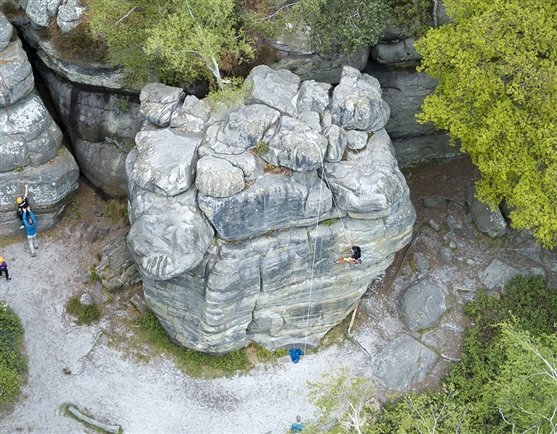 This initiative follows on from the very successful Portland Path Restoration project which was given financial support from the proceeds of the Dorset Bouldering Rockfax guidebook. Background on the arguments for and against the bridge can be found in this article. The minutes of the HMRG meeting can be found here. Read more about the decision from the BMC here.